The Stage - 12 March 1925. Grand Opera House, Belfast. "Chas. Mortimer in the heavy part in the piece is convincing, and the detective role, as played by Chas. Wanson, is successful. Greta Wood and Eunice Mann fill the respective roles of Rose and Mou-Mou ably." Exeter and Plymouth Gazette - Tuesday 25 August 1925. Theatre Royal, Exeter. "Mr Charles Mortimer, as the lascivious Herman Stetz, had an unpleasant role play, but he sustained it admirably. Miss Eunice Mann (American, a dancer), Miss Greta Wood (Rose), and Miss Mary gave just the right colour as habitudes of the White Coffin." Folkestone, Hythe, Sandgate & Cheriton Herald - Saturday 25 July 1925. 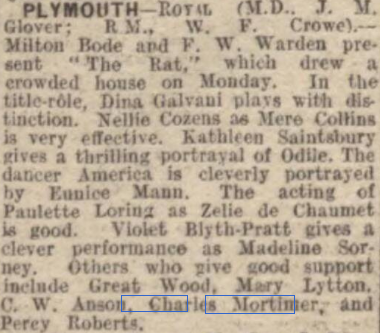 Greta Wood was in the cast of "The Rat", at the Theatre Royal, Exeter, in 1925, together with Charles Mortimer. From The Northern Whig of 10 March 1925. “The Rat” at the Opera House. Belfast. Gendarmes - F. Jorden and F. Broad. His eyes rend him throwing. Stands for a while distended. Then one he singles from the crow. He has loved and tired of them all—of all except Odile, whom he loves a sister, as mother, as grandmother—in short, with a chaste but careless affection—and Odile darns his socks and slips her little slice of bacon to his plate and smiles grief. Taken from the Devon and Exeter Gazette of 25 August, 1924.